Large appliances can be recycled for free at any of the San Joaquin County facilities. See the list of locations. You can also dispose of appliances for free through the annual Clean Sweep Program, which runs from February through October. Only one free pick-up is allowed per household, restrictions apply. You can also take them to any of these landfills. Consider donating small appliances to a community thrift shop. See the Donation Locations page for more information. Small appliances are made from dangerous materials, such as freon, chlorofluorocarbons and mercury. Don’t throw them away because they can leach toxic chemicals into the environment. Best Buy will take back fans, vacuums and other home electronics for free; they also offer a buyback program for more desired electronics. They accept up to three items per day from each household. Find a location here. Consider selling small appliances on Ebay or listing them for free on Craigslist. This approach brings the seller to you, which saves time and money; the environment will also benefit from less carbon emissions. Drop off unwanted appliances at any thrift shops that accept them, so these appliances don’t end up in a landfill. Electronics and small appliances are sold at most box stores, yet few of them offer takeback programs for small appliances. Walmart, Sam’s Club and Target did not have any small appliance takeback programs as of 2015. 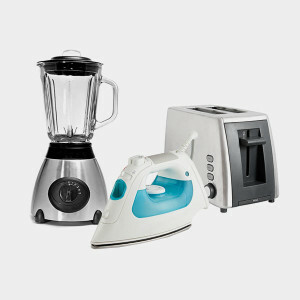 Best Buy is one of the few shops to take back certain small and large appliances.